Many thanks to IDJ for sending the article below. 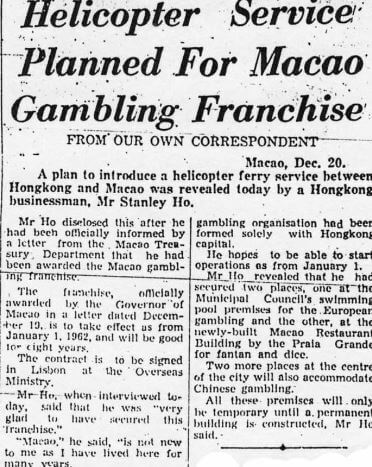 It announces that following Stanley Ho being awarded the Macau gambling franchise which took effect from 1st January 1962 he planned to introduce a helicopter service between Hong Kong and Macau. There are no further details about these proposals regarding locations, timetables, costs, helicopters etc. IDJ says the helicopter plan was never enacted and hydrofoils were used instead. 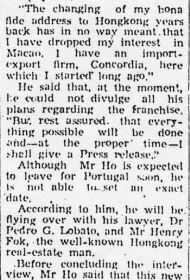 This article was first posted on 24th May 2017.